Mercedes – further driving impressions – HubNut – celebrating the average! I failed to get the Mercedes MOTd today, for many different reasons. Instead, I did a fair bit of driving around in it, taking the total covered mileage up to over 250 since purchase. Now it’s running much better, it really is a joy to drive. Like many German cars, including the Porsche 928 auto, it is a wonderful two-mode thing to drive. The throttle pedal has a rather long travel on it. This means that to make it go quickly, you have to make a bit of effort. The rest of the time, you just waft about with ease. It can make the car feel quite lazy – as does the Porsche actually for much of the time – but stretch your right foot all the way down and the scenery can get very blurry, very quickly. Yet it isn’t over-eager to kick-down. You can give it a decent shove of throttle say to climb a hill, and it’ll resolutely refuse to change down. I love that. Modern transmissions (A BMW E39 was particularly annoying in this respect) are far too keen to drop a cog, which makes smooth progress difficult. It really does only kick-down when you actually want it to. The two-mode operation is demonstrated keenly by the gearbox, as well as the throttle behaviour. There are two modes – S for normal (not sport, whatever people think) and E for economy. There’s very little difference between the two for most of the time. The default behaviour is for the car to pull away in second. In normal mode, a fierce shove of the throttle from standstill will cause it to actually select first gear. In economy mode, it just won’t, even if you’re got iron boots on and the light footedness of a herd of stampeding elephants. What impresses is that the automatic gearbox can smoothly change ratios when going gently, but also manages it when full hoon is underway. Acceleration is astonishing, overtaking stress-free as long as you remember to ease off the throttle again before illegal speeds are reached – that doesn’t take very long at all. Sure, it is not the most inspiring machine when it comes to handling – the steering still relies on a box and the soft springing mean it’s no sports car. But you can corner with confidence, nudging the throttle on entry, so you can give it a bootfull on exit. 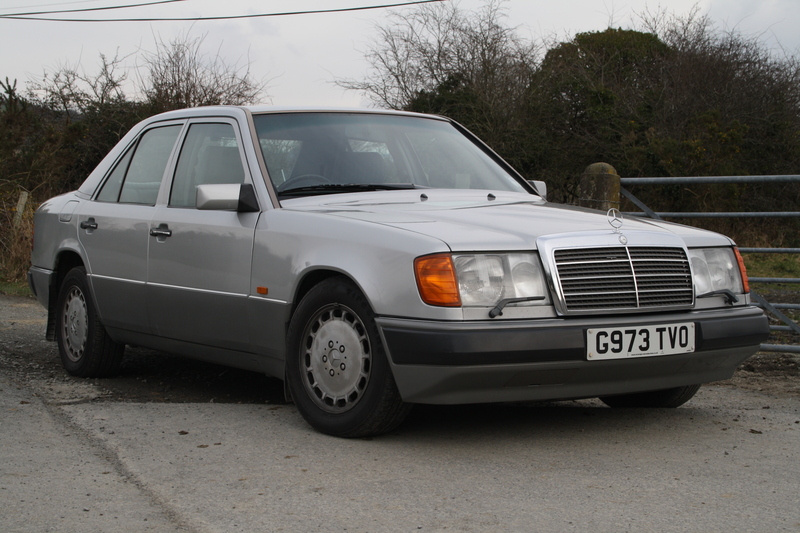 In fact, I’ve seen some rather startled expressions when folk see a large slab-like, elderly Merc saloon travelling at pace, even though it’s all perfectly within safe and legal limits. I prefer the taut feel of an Alfa Romeo 164, and the sonorous engine note, but the Merc is surprisingly enjoyable. I did consider a return to Alfa 164 ownership. I spied a red Cloverleaf – pretty much the ultimate 164 for me – but it was almost three times the price of the Mercedes. I had to ask myself, was it three times as good? My heart wants to say yes, but my brain isn’t having it.